Park Avenue in the context of Downtown Langley. Select graphic to enlarge. 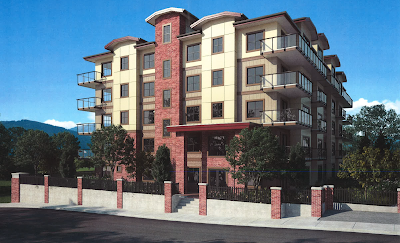 A new development is being proposed at the corner of Park Avenue, along Douglas Park. With the concept of the Park Avenue design area in mind, it was interesting to see that a 5 storey, 37 unit residential building is being proposed for this site. The units in this proposed building will be between 1,034 and 1,658 square feet. Proposed development along Park Avenue at Douglas Park. Select image to enlarge. While I’m not too concerned about the height of the building, the original vision was to see a softer transition between Douglas Park, Park Avenue, and buildings along Park Avenue. When walking along Park Avenue, you should feel like the street is a part of the park. 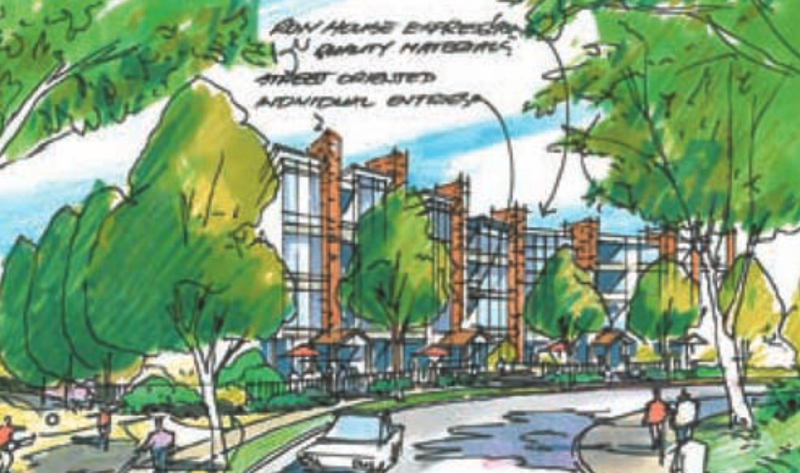 The original Phase II document of the Downtown Master Plan envisioned an example project that included street-oriented entrances to ground-floor units (like the newer Serenade Building at the corner of Douglas Crescent and Park Avenue) which would help create an outdoor living room. 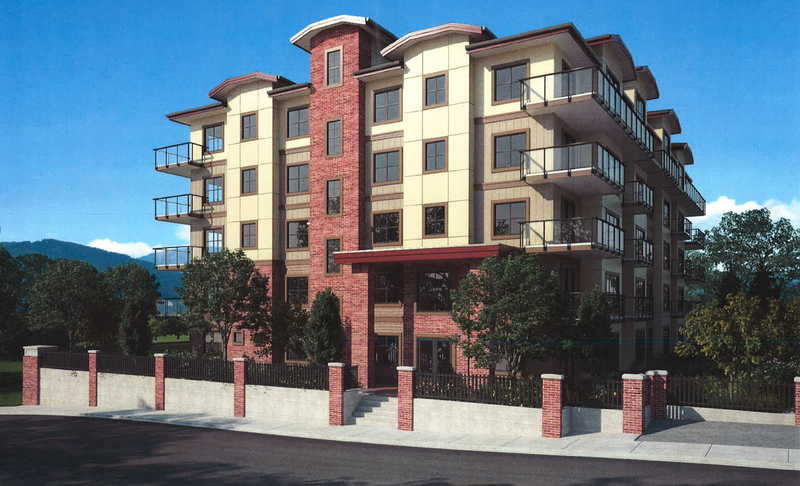 Render of same site as envisioned in the Downtown Langley Master Plan - Phase II. Select image to enlarge. The proposed building includes concrete walls fronting Park Avenue and Douglas Park. In the site plan, I don’t see any improvements to the sidewalk treatment fronting this proposed project that would create a park-like, welcoming environment. 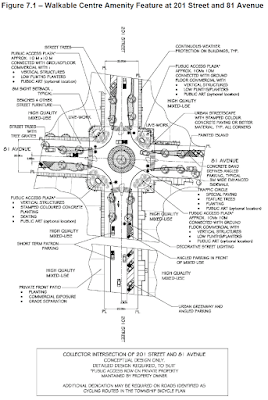 How could this proposed project be improved? A green wall, instead of an exposed concrete wall would certainly help soften the interface between the public realm and this building. Also, the sidewalk should include a green-buffer along the street to support the planting of street trees, placement of street furniture, and street lighting, while allowing for a wide sidewalk in keeping with Phase III of the Downtown Langley Plan. This would create a welcomimg environment for people. Downtown Langley is the heart of the City of Langley; the utmost care should be taken on how it is redeveloped. Over the past several years, visibility has been increasing on the relationship between how will build our communities and our health outcomes. In broad strokes, communities designed around people support positive health outcomes while communities designed around cars lead to negative health outcomes like increased obesity and repertory illness rates. Since the increasing body of research around health outcomes and built-form is relativity new, how to act on this knowledge hasn’t been embedded into the design process for communities in Metro Vancouver and British Columbia. A new “Health Impact Assessment of Transportation and Land Use Planning Activities” is included in a recent Metro Vancouver Regional Planning Committee agenda (starts on page 73). This is a guidebook plus a toolkit to help local, regional, and provincial planners quantify the health outcomes from individual development projects, major and minor transportation projects, to official community plans. The goal of a Health Impact Assessment, as proposed in the guidebook, is to help identify ways to minimize health risks and increase health benefits from plans, projects, or policies. These five categories would be evaluated for any plan, project, or policy that goes through the Health Impact Assessment process. The guidebook provides examples on how to apply a Health Impact Assessment to Official Community Plans, large development projects, and transportation projects. It also uses case studies. For example in BC, Interior Health has a process in place to evaluate large development projects if they are referred to the health authority. Also, TransLink preformed a Health Impact Assessment when looking at the options for replacing or upgrading the Pattullo Bridge. The guidebook shows examples on how to create a small-scale Health Impact Assessment which would take a few days to complete by one person, all the way to a comprehensive assessment which wold require several months to a year, plus a team to complete. The guidebook and toolkit have been designed so they can be used in all levels of government, and from small-communities to the City of Vancouver. I look forward to the day when Health Impacts Assessments will become an embedded part of the planning process, that will be acted upon to create healthier communities. The City of Surrey recently released a report titled “Economic Benefits of Surrey LRT” which was authored by Shirocca Consulting. These are the same people that did the TransLink Efficiency Review for the now defunct TransLink Commission back in 2012. The author of the report found that over a 12 year period, light rail construction will support 24,600 direct, indirect, and induced jobs generating $1.4 billion in wages and salaries in BC. Once construction is complete, the operation of light rail in Surrey will support 14,000 direct, indirect, and induced jobs generating a total of $810 million in wages and salaries over a 30 year period. In the report, direct employment includes working on the design, construction, and operation of light rail in Surrey. Indirect employment included people that work at suppliers and service companies that support light rail. Induced jobs are created when people directly or indirectly employed due to Surrey light rail start spending money in the community. While the report contains hard numbers about jobs, wages, and tax revenue generated due to light rail, the new economic opportunities and quality of life improvements that light rail will support in Surrey is a major driver for the need to build light rail in Surrey. The author of the report notes high-value investment and development will be attracted to light rail corridors in Surrey. This is due to the permanent physical presence of rail-based transit. Unlike SkyTrain, the author says that light rail is more cost-effective and supports a human-scale urban environment. According to the author, light rail “will also help maintain Surrey’s traditional role as a provider of more affordable, family-oriented housing”. This is because dollar-for-dollar light rail will be able to go further than SkyTrain, allowing more households access to fast and affordable transit. Because of this access, many households will be able to reduce or eliminate a costly vehicle. Because employers and employees in the high-tech sector want to be located near rapid transit stations, light rail will support high-value jobs in Surrey according to the author. -Preserve agricultural lands as development will be attracted to the light rail corridors, and not the urban fringe of Surrey. The City of Surrey also produced a “Surrey YES LRT” video to accompany the economic benefit report. You can find out more information, and download the full report, from Surrey’s LRT web page. Shortly after I moved from the Township of Langley to the City of Langley, close to a decade ago, I sold my car. I have been living car-free ever since. I’ve been able to do this because Downtown Langley (and the area of the City South of Fraser Highway) is walkable with easy access to shops and service. I’m also a 10 minute walk from the Langley Centre bus loop which gives me access to the rest of the region with a bus every 5 to 15 minutes. While I’m able to live car-free most of the time, I find that I usually have to rent a car one or two times per year. This weekend, I needed to rent a car because I was attending a friend’s wedding which was in Hatzic, about 20 minutes northeast of Mission. In the past, the car rental agency that I used was located at the corner of Fraser Highway and the Langley Bypass. This was really easy to get to as I could walk 15 minutes from my house to rental agency (along a sidewalk on Fraser Highway), or just catch bus. Because of a recent redevelopment project, that car rental agency is now located directly under the 204th Street overpass. This is actually closer to my house, as all I should need to do is walk up 204th Street from 53rd Avenue. Unfortunately, pedestrian access along the Langley Bypass is non-existent. The 204th Street sidewalk provides no access to the Langley Bypass. Even so, people will cross the Langley Bypass here to access it. Select image to enlarge. The 204th Street overpass has a sidewalk, but it was designed to prevent people from accessing the Langley Bypass. As you can see in the following pictures people still access the Bypass, via an unsafe, informal trail. Unsafe, informal trail that connects the Langley Bypass to the 204th Street Overpass sidewalk. Select image to enlarge. The Langley Bypass is the most pedestrian-hostile road in Langley. This makes sense because unlike most other roads, it is not maintained by the City or Township of Langley, but the provincial government. While the BC Ministry of Transportation might not want people to walk along the bypass, people still do. In fact, I walked past 10 people on my adventure to the car rental agency on the Bypass. 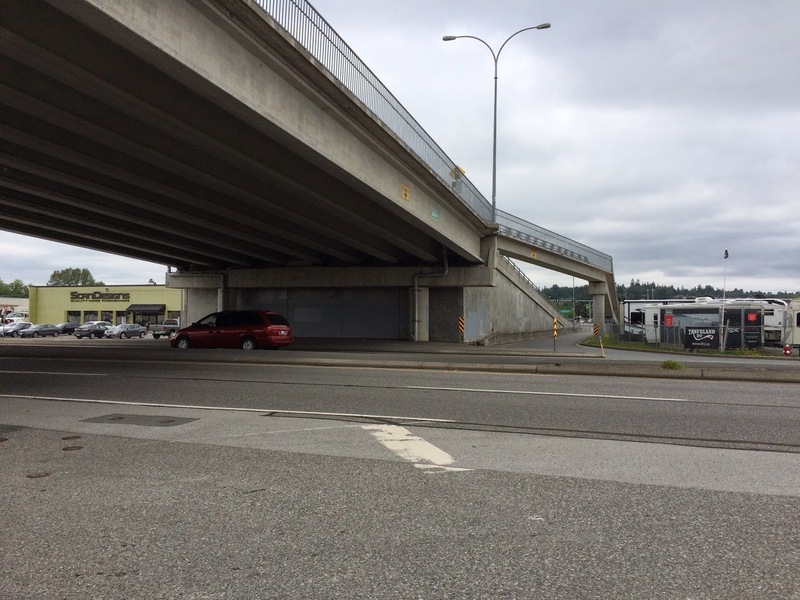 The Bypass is not going to turn into a pedestrian high street anytime soon, but the province should work with the City of Langley to make the corridor safer for all users. By trying to design away pedestrian access, it just makes the corridor less safe for people walking. No one is going to walk 15 minutes out of their way to cross at the nearest intersection that the Ministry of Transportation has deemed acceptable for pedestrians to use. They are going to cross the road without protection, use an informal trail, and use the 204th Street Overpass. When I originally went to pick up the rental car, I went 20 minutes out of my way, walking up Glover Road, then walking through parking lots on the south side of the Langley Bypass like a second-class citizen to avoid walking on that busy highway. 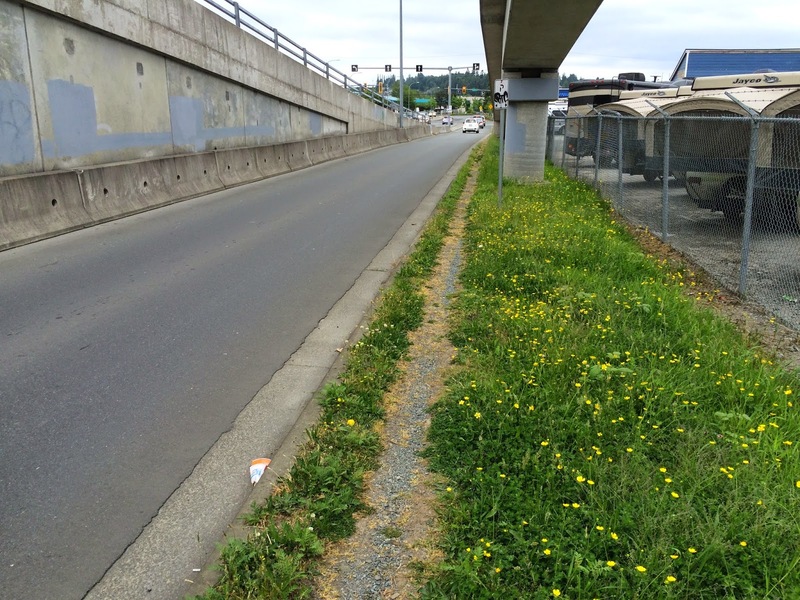 As long as there are shops and service along the Bypass, the City and the BC Government need to do a better job of making that stretch of road more accessible. Just because I don’t own a car, doesn’t mean that I should be denied access to shops and services in my community. 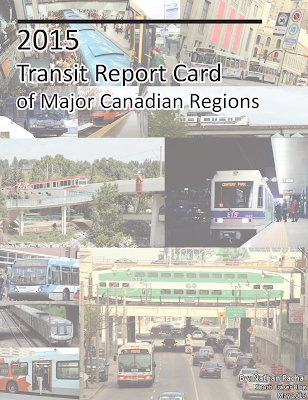 On Tuesday, I released the inaugural 2015 Transit Report Card of Major Canadian Regions. The report card evaluated transit service provided in Metro Vancouver, Edmonton, Calgary, Ottawa-Gatineau, Greater Toronto and Hamilton, and Greater Montreal. The report card showed that most regions had fairly comparable service, with Vancouver and Montreal performing significantly better. I had the chance to talk about the report card on Global BC1’s Unfiltered. You can view that interview below. Yesterday, I released a report card that compares transit service performance metrics of major Canadian regions. Metro Vancouver’s transit service scored high, with only the Montreal region scoring higher. 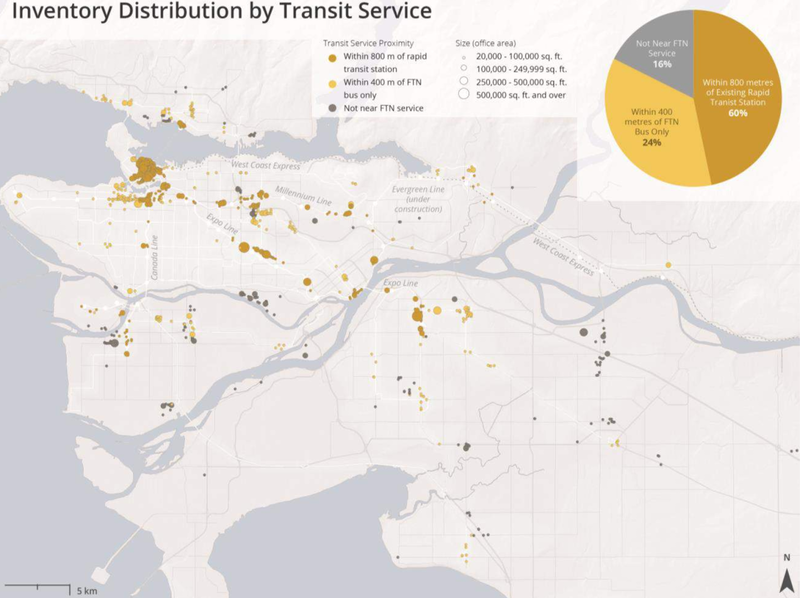 Transit service in Metro Vancouver did have the highest direct operating cost per service hour of major Canadian regions due to higher fuel costs and higher vehicle maintenance costs. For example, Vancouver’s trolley bus fleet is more expense to maintain than regular buses. 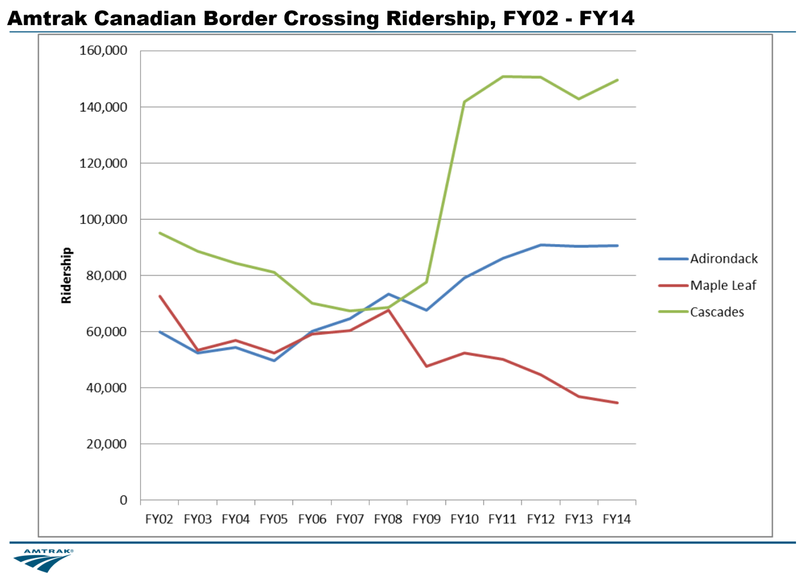 Because the Canada Line is a P3, it also has higher operating costs. Because transit vehicles in Metro Vancouver travel longer distances, they are subject to more wear and tear. Direct operating cost is how much money it costs to run transit service, but doesn’t include capital costs like the cost of purchasing new buses or trains. 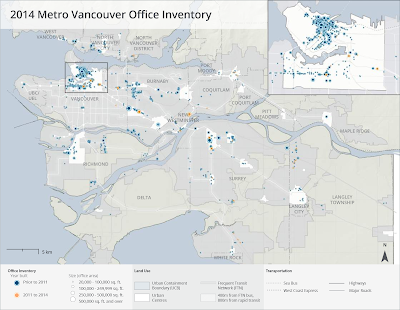 Metro Vancouver is the leader within Canadian major regions of having the most bums in seats for every service hour of transit provided. I did not include this in the report card, but there is another way of looking at direct operating costs per service hour: direct operating cost per person per service hour. This accounts for how efficient an agency is with each service hour of transit they provide. Operating Cost per Service Hour per Passenger Trip. Select graph to enlarge. Costs between $3.22 and $3.81 would get a “B” if it was in the report card. Cost under $3.22 would get an “A”. When I was reviewing the Latimer Neighbourhood Land-Use Plan, I came across at section of the plan that talked about the future of 200th Street. Today 200th Street is a speed way. It is up to eight lanes wide in some areas. 200th Street is the backbone for North/South connectivity in urban Langley. Langley Township has the lowest transit mode share of any community in Metro Vancouver at about 2%. While most people see 200th Street as a major highway, the long-term goal for the corridor will be to transform it into a multi-modal corridor. In the future, 200th Street will actually have more space dedicated for walking, cycling, and transit, then for driving. Potential Cross-Section of Ultimate 200 Street Corridor from Latimer Neighbourhood Land-Use Plan. Select Image to Enlarge. The long—term vision will see 200th Street transform into a boulevard with frequent transit service running down the centre. With high-quality transit service along 200th Street, transit mode share is predicted to increase to 8%, a four-fold increase over transit mode share today. With rapid transit, that number will be even higher. While frequent transit service isn’t provided along the 200th Street corridor today, the Township of Langley, through the Latimer and Carvolth Neighbourhood Land-Use Plans, is supporting high transit usage for when service is provided. If people vote “Yes” to the Mayors’ Council transit plan, the long-term vision for 200th Street will be much closer to becoming a reality. Last year, I posted about the Township of Langley’s plan for the Latimer Neighbourhood in Willoughby. This Monday, Township Council approved the third reading of this plan with the note that some “fine tuning” be made to the plan based on feedback from the public hearing. I expect this plan will be approved essentially as-is at the fourth and final reading. 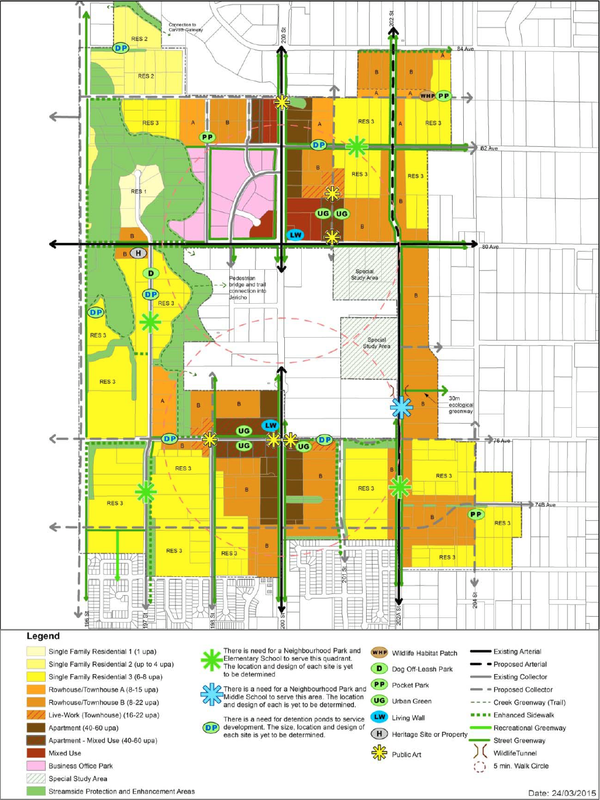 One of the major changes in land-use from the draft version of the plan, presented last fall, is on the northwest corner of 80th Avenue and 200th Street from a Business Park to a Mixed-Use designation. 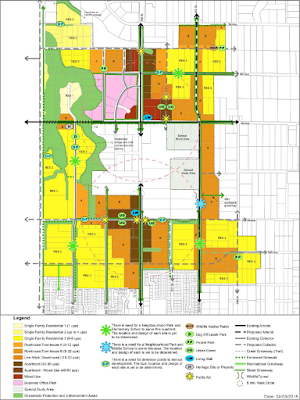 Latimer Neighbourhood Land-Use Plan. Select image to enlarge. The Latimer Plan has two mixed-use designation. “Mixed Use” which is in red on the map can be commercial-only or commercial/residential, and “Apartment – Mixed Use” which is brown with red hashes on the map requires ground-level commercial and above-ground level residential within the same building. Single-story building are not allowed in these zones. At the intersection of 200th Street and 80th Avenue, the Township is requiring “landmark buildings” which must be at least three storeys, to a maximum of 12 storeys. In all cases, the ground-level commercial must have pedestrian access via the street front. 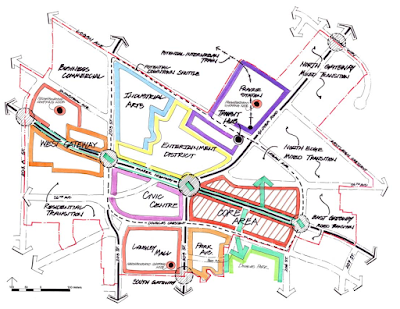 The major theme in the Latimer Plan is the creation of a walkable community. For example, gas stations and drive-thrus will not be permitted in Latimer. 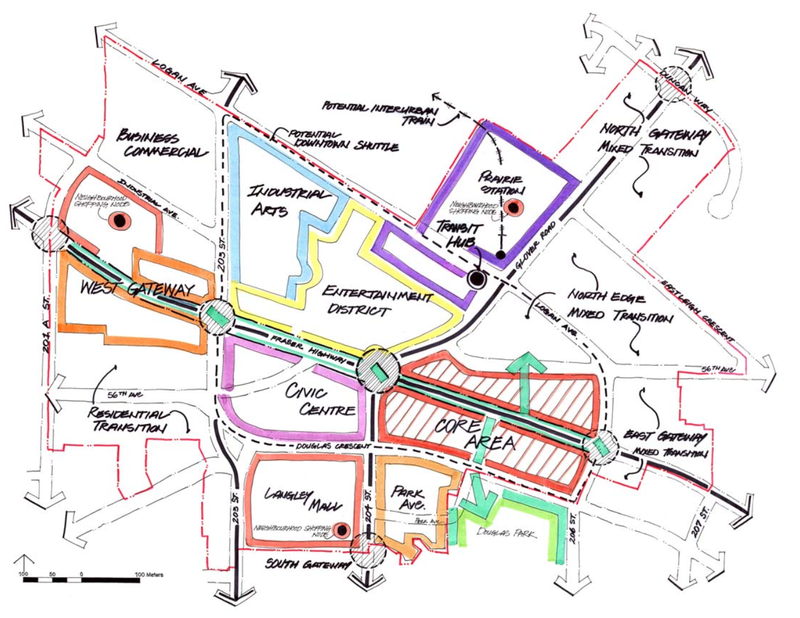 With the exception of the pre-existing business park, all commercial development must be walkable. Building street-front surface parking lots is a sure-fire way to kill walkability, so I’m happy to see that the Township has put a lot of thought into parking. For example, 50% of all parking in the mixed-use zones and business park zone must be underground or in a concealed parking structure. If a developer commits to underground parking, the Township will reduce commercial parking requirements by 10% as an incentive. All buildings in the mixed-use zones must front the street. When there is surface parking, the majority of it must be hidden behind the rear of the building. Some surface parking may be permitted on the side of a building as long as it is screened from view from the street. The Latimer neighbourhood will contain two walkable neighbourhood centres. One at 201st Street and 81st Avenue, and one at 198th Street and 76 Avenue. 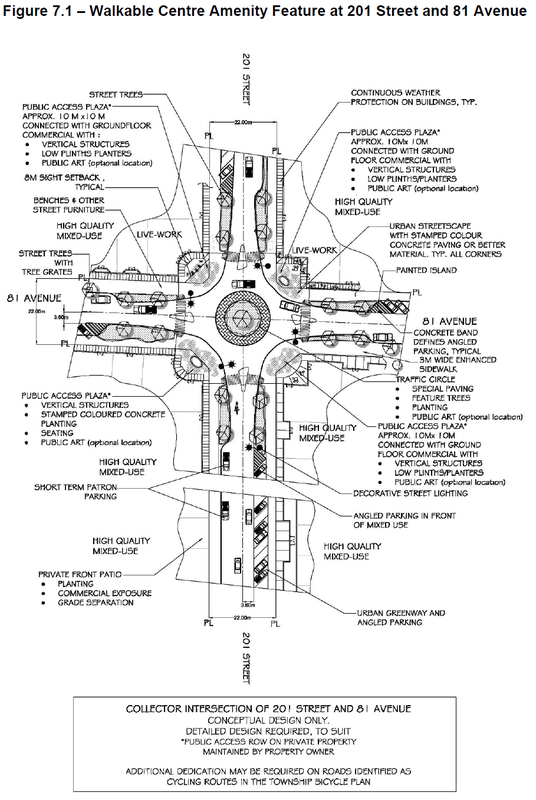 Walkable Node at 201st Street and 81st Avenue. Select image to enlarge. Mixed-use buildings will form the centre of these nodes with live-work townhouses at the edge of the nodes, before transitioning to various density residential-only areas. Live-work units are indented to create a pedestrian-friendly street wall, and must have the commercial part of the unit fronting the street. The Latimer Neighbourhood will also have a system on on-street and off-street greenways for walking and cycling. I’m excited to see this neighbourhood plan turn into reality, and it is good to see that the Township is talking walkability seriously. Back in March, I posted about BC on the Move, the province's new 10-year transportation plan. I noted that the plan would guarantee construction of more freeways in the region, but that's about it. The province did extensive consultations throughout BC to see what residents thought were transportation priorities. Detailed regional summaries were produced, and it is very interesting to see what people in the Lower Mainland thought were priorities. Priorities are ranked by broad categories, then by the specific improvements under those categories. The Lower Mainland includes Metro Vancouver and the Squamish-Lillooet Regional District up to about Whistler. Participants in the consultation who lived in the Lower Mainland were asked to identify their top three priorities for transportation infrastructure improvements. People in the Lower Mainland placed higher priority on expanding public transit than building new freeways. Replacing the George Massey Tunnel didn’t even make in on the top three list as only 123 people ranking replacing the tunnel as a priority. The province also committed to fund one-third of the capital cost of new public transit infrastructure in Metro Vancouver. Though the province called for a transit plebiscite, which if people vote No, renders this investment promise a moot point. $6 million per year for improved cycling across the whole province, while good is small, and is just a continuation of the current provincial cycling funding program. People in our region want the provincial government to increase funding of public transit, invest in more bike lanes, and keep our roads in a state of good repair. It seems that the province is more interested in building new bridges and expanding freeways. There seems to be a disconnect between provincial transportation priorities, and regional transportation priorities in the Lower Mainland. Langley City Park is located along 207th Street between 48th Avenue and 51B Avenue. It is one of the larger parks in the City, and is host to many amenities such as a swimming pool, water park, picnic tables, playgrounds, and various sports fields. 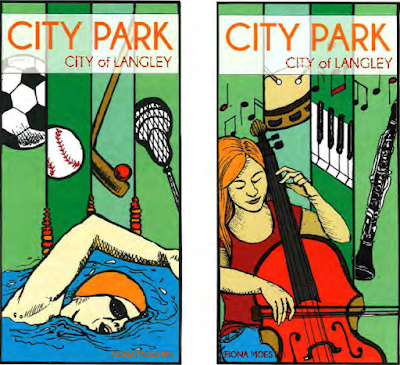 City Park is also home to the Langley Community Music School. This park, like the Nicomekl Floodplain Trail System, is a destination which serves the whole community. If you just walked by the park, you wouldn’t necessary know that it was a premier park or what amenities where in the park. The original goal was to have this in place for the BC Seniors Games in August 2014. Tonight, Council will be voting to approve the following two items for City Park. 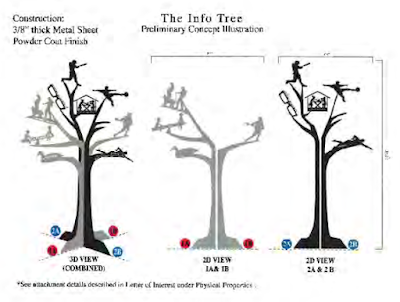 The first piece is called “The Info Tree” which outlines the various sports and facilities that are in the park. While this tree provides a degree of wayfinding, it complements and does not negate the need for the City to implement its full wayfinding strategy. The Info Tree Wayfinding Public Art for the corner of 51B Ave and 207th Street. Select image to enlarge. 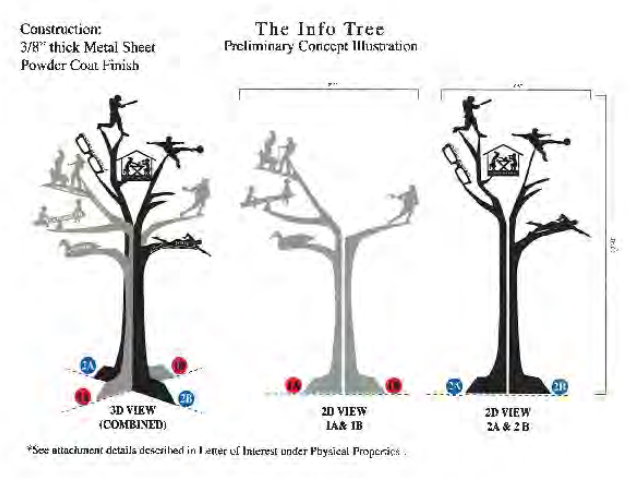 Proposed street banners for 207th Street along City Park. Select image to enlarge. On another park note, as Langley City is getting an additional dog off-leash park, the current dog off-leash park at the corner of 206th Street and 44th Avenue is being renamed the Uplands Dog Park. If you are still on the fence about which way to vote, I’ve posted information about the Mayors’ Council plan, and what it means for Surrey and Langley. For non-biased facts about our transportation system in Metro Vancouver, and why increased funding is needed, check out Discourse Media’s Moving Forward data journalism project. You can vote. If you haven’t registered to vote, you can do so online or by calling Elections BC at 1-800-661-8683. If you’ve lost your voting package, or it got damaged, call Elections BC today. May 15th is the last day you can request a package, or register to vote in the plebiscite. You can also stop by a Plebiscite Service Office. In the South of Fraser, there are offices at Willowbrook Mall and Central City Mall. 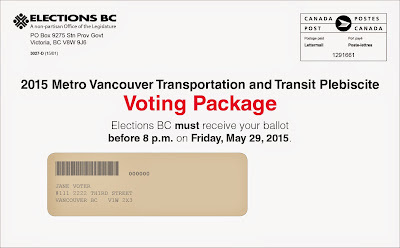 Your ballot must be received by Elections BC by 8pm on Friday, May 29th. 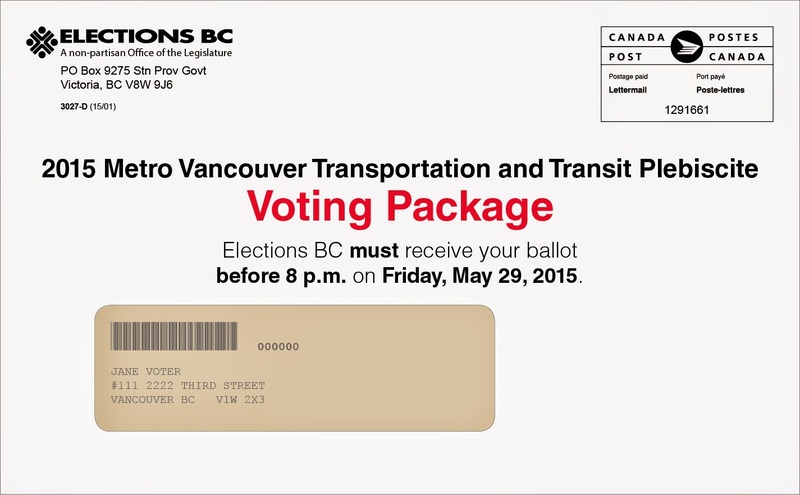 This means you’ll want to get your ballot mailed off as soon as possible. If you are a last-minute kind of person, you can drop off your ballot at a Plebiscite Service Office. So mark an x, and get your ballot in the mail today! For the last several years, I have been following Port Metro Vancouver as it works towards building Roberts Bank Terminal 2. This project would expand the amount of shipping containers that the Port could handle by adding three new berth at its Delta facilities. As this is a major project, it is subject to a federal/provincial joint environmental assessment. Port Metro Vancouver’s Environmental Impact Statement (EIS) for the proposed project has been recently posted to the Canadian Environmental Assessment Agency’s (CEAA) website. Until June 15, members of the public can comment on whether the EIS “contains enough information to being a technical review.” People are allowed to comment on whether they believe Port Metro Vancouver’s EIS meets the guidelines established by the CEAA. Basically, if the CEAA asked Port Metro Vancouver to talk about apples, oranges, and bananas, but the Port only talked about apples and oranges, members of the public could point that out. It doesn’t matter if people believe that the information presented by the Port about apples, oranges, and bananas is accurate. The EIS is thousands of pages long. It would be a daunting task for anyone to review the EIS, even if just to see if it is missing something as outlined in the CEAA’s EIS guidelines for the project. Port Metro Vancouver has prepared a 124 page Executive Summary of the Environmental Impact Statement. If you are curious about the project, this would be a good place to start. From the Port’s perspective, any impact to the environment, human health, or regional infrastructure, can be virtually eliminated. Of course, this was only within the areas that the Port was looking at in the EIS. Two things that I was interested in were impacts to our transportation network, and air quality. 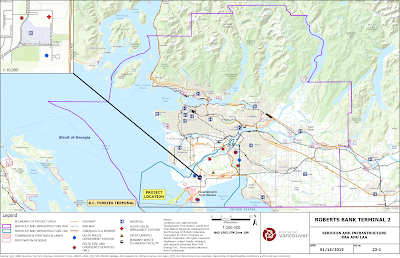 Proposed Roberts Bank Terminal 2 - Service and Infrastructure Regional Assessment Area and Local Assessment Area. Select map to enlarge. In 2012, there was an average of 2,442 daily truck trips generated by Deltaport and the Westshore Terminals. With the addition of Robert Bank Terminal 2, there will be an average of 7,382 daily truck trips by 2030. In 2012, there was an average of 17 daily trains trip generated by Deltaport and the Westshore Terminals. With the addition of Roberts Bank Terminal 2, there will be an average of 29 trains a day by 2030. The Environmental Impact Statement has Local Assessment Areas, and wider assessment areas. Assessment areas are geographical boundaries in which the EIS speaks to. The Local Assessment Areas have the greatest amount of focus in the EIS. For example, the EIS talks about the effects of rail traffic in the Local Assessment Area which consists of most of Delta. The EIS notes that there will be additional air pollution in Delta, and impacts on other social-economic indicators in the community. It also proposes mitigation measures that the Port will perform as part of the project. Surrey and Langley are not in the Local Assessment Area, so the EIS does not talk to the impacts of additional rail traffic in Langley. Because Langley isn’t in the Local Assessment Area, the Port wouldn’t be obligated to do much to mitigate impacts as a result of the Roberts Banks Terminal 2 project. While overall human-health impacts are considered region-wide in the EIS, detailed air quality assessments were only performed for Delta and the southern part of Richmond. It seems interesting that a full air quality assessment wasn’t done for the whole region, as we are in the same airshed. 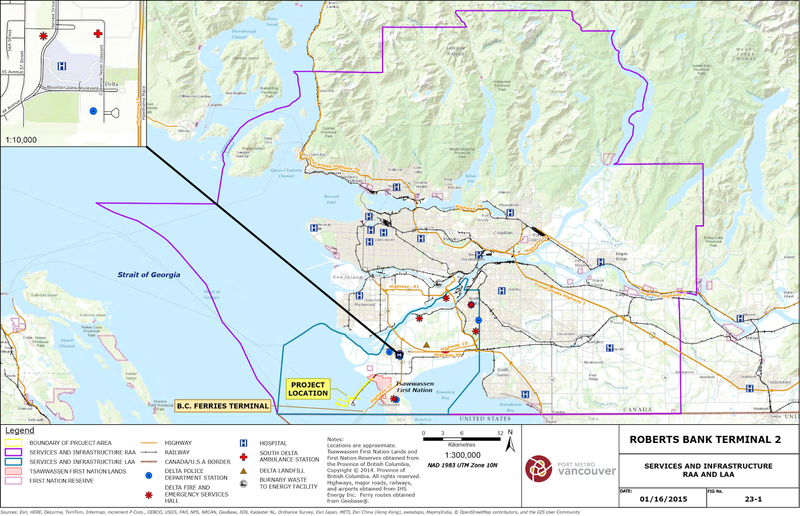 While I’m sure the Ports’ plan to mitigate any impacts from the Roberts Bank Terminal 2 project within the Local Assessment Areas will be world-leading, I am concerned about communities like Surrey and Langley which will be stuck with more rail and road-traffic, but with limited resources from Port Metro Vancouver to reduce the impact of this increased traffic.